Three weeks into my initial deployment with Christ in Action during Hurricane Sandy. Thankfully, we are ‘off work’ today to rest, observing the Sabbath. Our director and crew leader are preaching at neighboring churches. 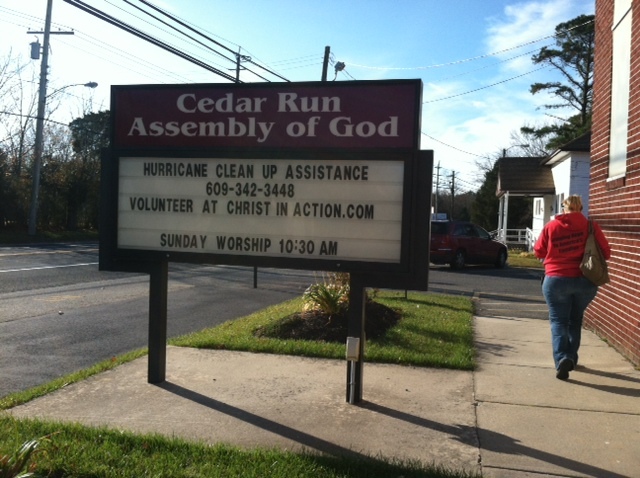 I attend a comforting service with friends in a beautiful little church called Cedar Run Assembly of God (CRAG). Stained glass windows flank the sides and the thickness of the outer walls give evidence to it’s long history. Originally constructed in the mid 1800’s, the newer brick facade provides a modern garment but it’s obvious the old girl has weathered storms besides Sandy. Yet she stands, a beacon of hope and a sanctuary of peace, an outpost on a highway leading to a summertime haven often forgotten or overlooked. Now, she is shining again, reppin Jesus as her pastor and congregation respond to the need in their community.